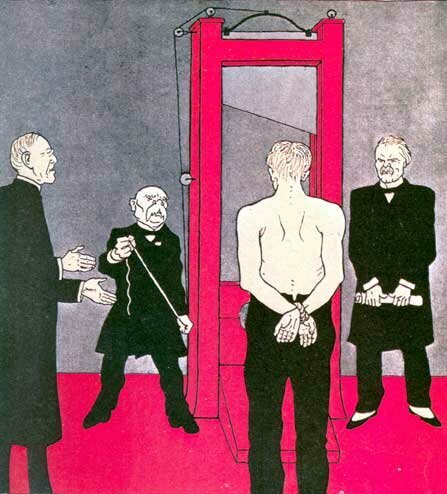 Although Germany had the choice to accept or to reject the Versailles Peace Proposals, the country was already condemned to death, according to this political cartoon that appeared in the German magazine Simpliccimus on June 3, 1919. The principal judges and executioners were (from left to right) the American president Wilson, the French president Clemenceau and the British prime minister Lloyd George. The Heritage of the Great War offers you the complete text of the Versailles Treaty, June 28, 1919. Read all about the New Bounderies, the Left Bank of the river Rhine, the Alsace, the German Kaiser, the African Mandates, China, the Military Measures taken against Germany, de Prisoners of War, the War Graves, the Reparation Payments (exact how many goats, cows, heifers etc were to be delivered to France, Belgium, Italy and other countries) and the Penalties. download it as a zipfile (138 kb). Both versions are in html-format.